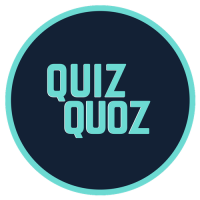 Quiz Quoz is a fast, fun trivia game anyone can win. 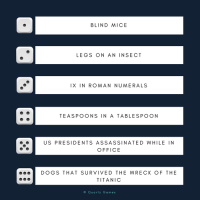 Think a traditional quiz meets tic-tac-toe, meets bingo, with three unique strands of luck that mean even a beginner can beat a brainbox. The game takes a minute to learn, is family-friendly and takes 15-30 minutes to play. We launched in May 2018 on Kickstarter and reached our target funding in 30 days. Join our mailing list now, and check out Quiz Quoz on Amazon ! 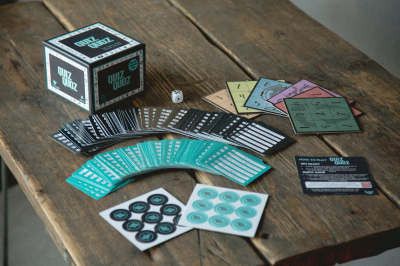 Quiz Quoz comes with 171 cards (1026 questions in total), meaning the game has great replayability. Each card has a front side with 6 questions of ranging difficulty, and a back side with the answers (and usually a fact or two). 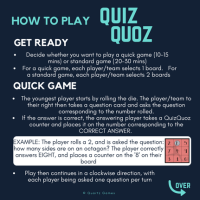 Quiz Quoz is simple to play! It takes just a minute to learn the rules and this handy guide will take you through how to play a quick game (15 minutes) or the standard game (20-30 minutes). The game contains six boards, each with cool original designs. Pick your board and start quizzing. There are 30 Quiz Quoz tokens in each box. The tokens are double-sided and used to mark correct answers. 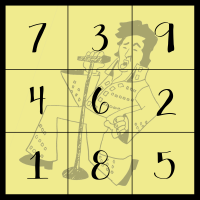 Three tokens in a horizontal, vertical or diagonal row and you've won!